Editor's Note: Tom Goldstone is the executive producer of Fareed Zakaria GPS. This article originally appeared in September 2011. The views expressed are his own. As America looked inward in the days, weeks and months after September 11, 2001, others around the world made extraordinary gestures toward the United States. We were all so focused on ourselves – understandably so – that many probably missed the fact that Iran’s President Mohammad Khatami condemned the attacks, that Ireland and Israel held full national days of mourning, that the Afghan Taliban told “American children [that] Afghanistan feels your pain”. You are even less likely to have heard what could be one of the most touching reactions of all. This is the story of how a destitute Kenyan boy turned Stanford student rallied his Masai tribe to offer its most precious gift to America in its time of need. It all starts with Kimeli Naiyomah. Kimeli, a member of a Masai tribe, grew up in a small rural town called Enoosaen near the Masai Mara National Reserve. The town had no water, no electricity, no phones and no roads. After accompanying his ailing mother to the hospital as a young boy, Kimeli says he knew he wanted to grow up to heal others like her. He didn’t know such people were called doctors - he just knew he wanted to be one. Dreaming of being a doctor is ambitious even in America. But in Kimeli’s part of Africa, one could have easily dismissed that dream as impossible. This was especially true in Kimeli’s particular situation. He says he had no father. His grandmother had been murdered. And his mother – his only remaining caretaker – was battling alcoholism. According to Kimeli, his family (or lack thereof) was so destitute that his Masai tribe didn’t even consider them people – they were sub-human. Moreover, nobody that Kimeli knew from his tribe had gone to high school, let alone college or medical school. He knew he had to change his situation, so he ran away – to another village where he had heard that there was a school that was taught under a tree. It was a church school and it became his grade school and his home. When he grew beyond this school-under-a-tree, Kimeli found the nearest high school, which was 9 hours away. So he walked there and told the principal that he had no money, no uniform, no books, no shoes and no family, but he wanted to attend school. And, as Kimeli tells the story, the principal was so amazed by Kimeli’s gumption that he welcomed him to the school. The same elders who had once considered Kimeli to be sub-human had done a complete reversal. Kimeli says his people were now were so impressed by what he had achieved that he was not only considered human again, they were invested in helping him achieve his goals. They raised $5,000 for him. A Washington Post reporter then caught wind of the story and came to Enoosaen to write a story about Kimeli’s doctoral dreams. That story ended up on the front page of the paper. The article inspired an outpouring of support, including a scholarship offer from the University of Oregon, a plane ticket from a businessman in Florida and clothes and other materials he needed to survive in America paid for by another total stranger. Kimeli enrolled at the University of Oregon in 1996. A few years later, Kimeli heard about Stanford University (after Chelsea Clinton enrolled there) and decided after seeing the school that that was where he belonged. He says, “It looked like a village to me”. And once again, Kimeli made his own luck, getting accepted at Stanford after getting his grades up in Oregon. 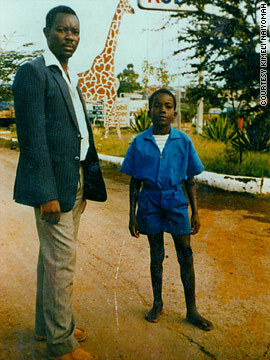 Kimeli had become a celebrity of sorts back home. In September of 2001, the President of Kenya was scheduled to be in New York and Kimeli says he was invited to meet with him. And that’s how Kimeli – now officially a full Masai warrior back home – found himself in New York City on September 11, 2001. Kimeli says he is also a very emotional warrior. 9/11 touched him deeply. The country that had given him so much had been brutally attacked. He had to figure out a way to help. He had to do something. So, on a trip back home in May of 2002, he asked to meet with the elders of his tribe. First, Kimeli told them of the horrors he had witnessed in New York. Many of Kimeli’s people had never even heard of 9/11. They couldn’t even fathom buildings that tall and most people in the village had never seen a plane except way high up in the sky. Then, Kimeli told them of his plan. He wanted to buy a cow (something this formerly homeless boy had never been able to do) and turn right around and give that cow to America. In Kimeli’s tradition, a cow is the most precious property one can own. And it is believed to bring great comfort to its owner. As one elder told a reporter, a cow is a “handkerchief to wipe away tears”. He wanted his elders’ blessing for his plan. But, unexpectedly, one-by-one the elders stood up and said they were so inspired by his plan they wanted to do the same. In the end there were 14 cows that had been pledged to the American people to help bring them peace. On June 3rd, 2002, U.S. charges d’affairs William Brencick travelled to Enoosaen to formally accept the cows. He says it took him more than half-a-day to get there - a flight and then a long drive over treacherous terrain. But after he heard Kimeli’s story, he wanted to go. Brencick expected to be greeted by a handful of people, but when he arrived, he found a large crowd. Kimeli says more than a thousand people were in attendance. Kimeli had brought American flags with him. The “Star Spangled Banner” played on a loudspeaker. Some in the crowd held up banners that said: “To the people of America,” “We are touched by your loss” and “We give these cows to help you”. Brencick says it was “overwhelmingly emotional” and he couldn’t help but tear up. But there was a hitch. Logistical and monetary problems prevented the U.S. from taking possession of the cattle. The herd was worth much less than the considerable amount it would cost to ship it 7,250 miles to New York City. And there were health hurdles: African cows weren’t allowed in America. In addition, there was concern that the cows might not survive the voyage anyway. Washington Times columnist Tony Blankley heard what was going on and wondered how the U.S. could get 80,000 troops into Afghanistan, but couldn’t get 14 head of cattle out of Africa. As for the Masai, they couldn’t quite understand why this American came to accept the cows, but then didn’t take them home with him. Some wondered why he didn’t just load the cattle on a truck and drive them to America. Four years later, on the 5th anniversary of the September 11th attacks, all was made right. Then-U.S. Ambassador Michael Ranneberger traveled to Enoosaen to cement a deal for Kimeli’s tribe to take care of “America’s” herd in perpetuity. And, as a way of saying thanks, the Ambassador announced the establishment of a scholarship for 14 boys and girls in the village to go to local schools. Those scholarships continue to this day. And today the herd continues to grow. As of right now, 35 “American” cattle roam the plains near Enoosaen, tended lovingly by one of the elders in Kimeli’s tribe. If you ever find yourself there, you’ll know which are the American cattle. They have special Twin Towers markings on their ears. As for Kimeli, he’s decided he can do more for the world as a diplomat than a doctor. Next fall, Kimeli hopes to become a Rotary International World Peace fellow at Duke University. If you’re interested in reading more. Kimeli’s story is featured in a children’s book 14 Cows for America. A free copy of the book is available for all those who lost family members on September 11, 2001. Long live the people of America – From the people of Kenya. And may Kenya flourish while maintaining all of its untamed beauty for the world to cherish for the future generations yet to come. This story shows us all the beacon of hope that is America. Today America must not be swayed by Russian propaganda. It must decide for itself what is the right path for the people of Syria and must not be deterred by outside interference from others than say that we are not exceptional. Well Mr. Putin America is only going to be ordinary if we let you and RT News and visits from the Russian Duma sway us from our resolve to solve the Syrian crisis. Now go back to Russia and investigate your own house full of human rights abuses. El Triángulo de Oro de Agra, Delhi y Jaipur es un viaje emprendido famoso por los turistas que viajan a esta parte del país en las tres ciudades históricas están bien conectados ya poca distancia el uno del otro para encajar el proyecto de ley para una escapada de fin de semana. La ciudad de Chandigarh hacia el norte es también una gran opción para explorar el ambiente relajante de una de las ciudades mejor planificadas de la India. Estas son sólo la guinda de la torta allí toda serie de otros destinos que se puede considerar por perfectweekend escapadas cerca de Delhi, para pasar un momento agradable con su familia y amigos. my own blog and would like to know wherte u got tthis from. Wow. What a beautiful gesture. Had never heard of this before until today. How touching. Thank you to the people of Kenya. I met the Masai years ago on a trip to Africa. They were very welcoming of me. This story touched me deeply. Asanteni! I am not even American and this story is just wow, all you hear is wars and death and crime and rarely good deeds but this. Giving something to America that is your most precious item is just nice sad they couldn't go back to US but the other thing was good. Keep it up Masai and your tribe. A professional web design company is one who employees the robust talent to be a part of their force. For example, the professionals at Automatic Website Services are known for using the efficient and innovative technologies for the satisfaction of their clients, therefore it is a wise choice to hire those companies for Web Development Company New York who achieve success for your brand through robust development. ZLATAN IBRAHIMOVIC says he joined Manchester United to silence his "unknown critics.